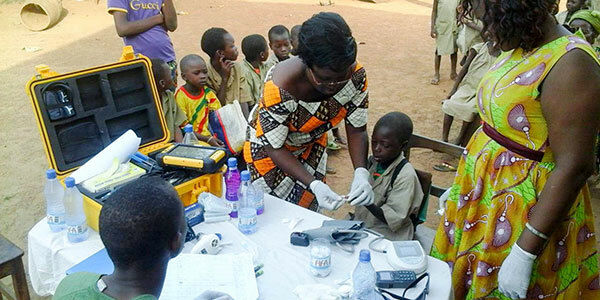 In Benin, an ICT4D ‘Telemedicine Kit’ pilot by SOS Children’s Villages, Inmarsat and Safe Patient System is bringing advanced medical care to communities far from hospitals. Joanne Miller, a co-worker with the SOS Family Strengthening Program in Benin, was visiting families in the remote Abomey-Calavi region when she noticed the condition of a little boy named Elias. Elias was eating, but he was losing weight and felt weak. It was obvious the boy needed to see a doctor, but the next hospital was a two-day journey by foot. Instead, Joanne took out her ‘Telemedicine Kit’, consisting of medical instruments, a laptop and medical software. She started up the laptop and, with the help of the Safe Patient System software, began to record Elias’ vital statistics, including his temperature, weight, height, blood pressure and blood sugar level. When Joanne finished recording Elias’ information she transmitted the data in real-time over the Inmarsat network, using the Broadband Global Area Network (BGAN) – a global satellite internet that provides simultaneous voice and broadband data communications from small and lightweight satellite terminals. In a city hospital some 200 km away, the doctor on duty received Elias’s data and quickly provided Joanne with a diagnosis and advice for the boy’s treatment. Elias’ diagnosis: diabetes. “I did not know at all that my son was suffering from hypoglycemia,” said Elias’ father Robert. "Our health co-workers can, during periodic visits to families in the Family Strengthening Program, use the kit to collect medical data and transmit it in real time to the doctors," said Mr Salimane Issifou, National Director of SOS Children's Villages Benin. "The doctors can then ensure the health follow-up for these families. On Joanne’s next visit to Abomey-Calavi she rechecked Elias’ vital statistics using the Telemedicine Kit, updated his records in the software program, and consulted with the doctor once again. Elias’ blood sugar had stabilized, and he was on his way back to full health. The ‘Telemedicine Kit’ is enabling SOS co-workers who work with families in extremely remote areas of Benin to detect and treat diseases such as high blood pressure, diabetes, respiratory infections, skin diseases, otitis, bronchitis, eye diseases and malnutrition. Since its launch in September, 2014, this 'information and communications technologies for development' project, also known as ICT4D, has enabled 980 advanced medical consultations in the remote Abomey and Dassa-Zoumé regions, far from medical infrastructure. “Across the world we are seeing how telemedicine can improve the lives of countless families, particularly children, living in remote and isolated regions of the world,” said Drew Brandy, Vice President of Inmarsat. "Telemedicine can only succeed with a reliable, always-on communications network, which is often not available in the locations where remote health is needed most,” he added. The Telemedicine Pilot Project by SOS Children’s Villages Benin was made possible with the support of Safe Patient System and Inmarsat. 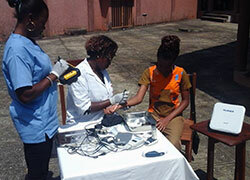 Safe Patient System provided SOS Benin with the Telemedicine Kits. Inmarsat provided loaner BGAN terminals and Link Geostationary services at no cost to connect SOS Benin’s co-workers with doctors at urban hospitals.